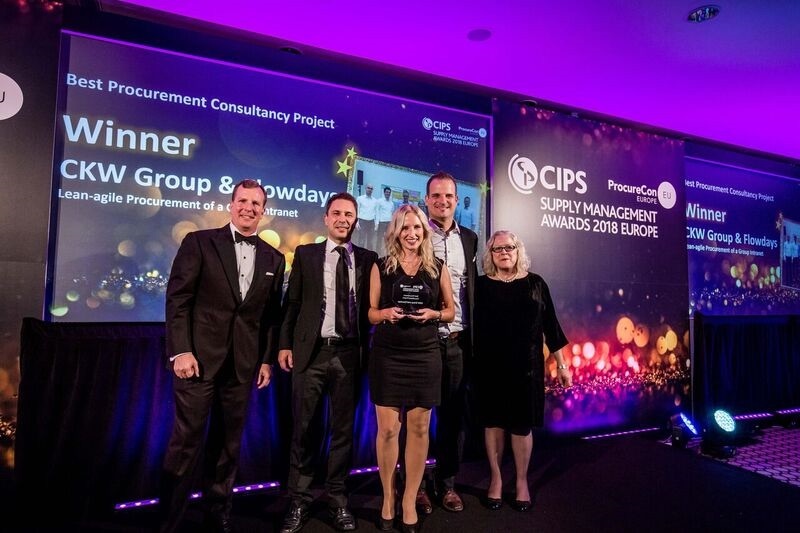 CKW and flowdays won the most important European award in the procurement industry with the Supply Management Award. The award honors the innovative and agile procurement process for a new intranet from CKW. In a so-called Pocathon (Proof of Concept and "Thon" by Marathon), the teams and products of three intranet providers were put through their paces for two days. The goal was to implement real CKW application needs. "On the one hand, we wanted to test whether the products actually meet our expectations, whether the intranet fits in with CKW's IT landscape and whether a legal, commercial partnership agreement could be found," says Andreas Schneider, Head of Supply Chain Management at CKW. "With the approach 'Lean-agile-Procurement', we were able to significantly shorten the time from the idea to the productive start of the new intranet compared to traditional approaches». Specifically, CKW signed a letter of intent with the winner after exactly two days, 1st Quad. Usually, such a procurement process takes weeks. Just six months after the Pocathon, CKW's new intranet was put into operation in mid-October 2018. A further advantage for the project managers of CKW was that they did not get to know the salespeople of the three suppliers, but specifically the implementation team. Recently, Andreas Schneider, Head of Supply Chain Management of CKW, Yvonne Ruckli, Project Manager of CKW and Mirko Kleiner, Agile Coach of flowdays in Prague, accepted the award. Caption: Recently, Andreas Schneider, Head of Supply Chain Management of CKW (2nd from left), Yvonne Ruckli, Project Manager of CKW (3rd from left) and Mirko Kleiner, Agile Coach of flowdays (4th from left) in Prague were honored answer.